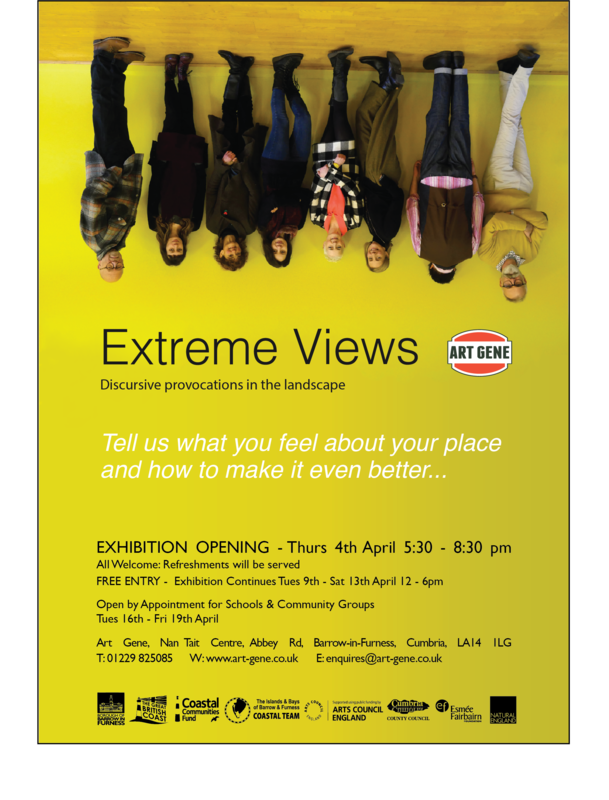 Art Gene are pleased to announce the Extreme Views Exhibition 2019. The show will showcase work produced by the Art Gene team and Extreme Views Artists-in-Residence 2018-19. This exhibition brings together film, photography, installation works’ and knowledge achieved through project activity and the Extreme Views events. Exhibition continues Tuesday 9th – 13th, 12pm – 6pm. Download Extreme Views Exhibition Flyer here. ‘Extreme Views’ seeks to forge a commonality of purpose through hearing conflict at the grass roots – Navigating the no man’s land which lies between different interests, agendas and demands on space: Industrial – Social – Environmental. To gather and respond to that collective intelligence – imaginatively devising strategies and projects which empower whole communities to build sustainable, locally relevant and meaningful change. We need to recognise and learn from the cultures which thrive within our communities and stop telling them they are deprived and excluded because they don’t recognise, engage with or particularly value ‘ours’. That means working with the folk you trust and especially the folk you don’t trust – those which share your values and those that don’t. ‘Extreme Views’ begins with deep listening, respect, sharing food, open debate, a mutual valuing of place, the will to cooperate, to learn from each other and an ability to change ones mind. In 2018 we commissioned Louise Adkins, Clara Casian and Dr David Haley to collaborate with Art Gene to develop work to add value to the Extreme Views Programme: to draw out, respond to, and engage with grass roots cultural activity as a means through which to reveal a locally distinctive connection with place. To celebrate a different perspective, add to our collective understanding and grow wider perceptions of how our communities engage with and perceive their environment – the social, natural and built features of our place.